It is a wonderful thing that something so simple, so thrifty, can be so satisfying. 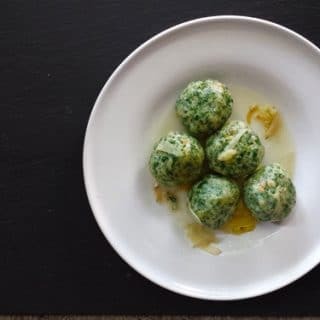 These ricotta-spinach dumplings are little more than stale bread, a bit of cheese, an egg and whatever green thing you happen to have in your kitchen, your garden or your yard. 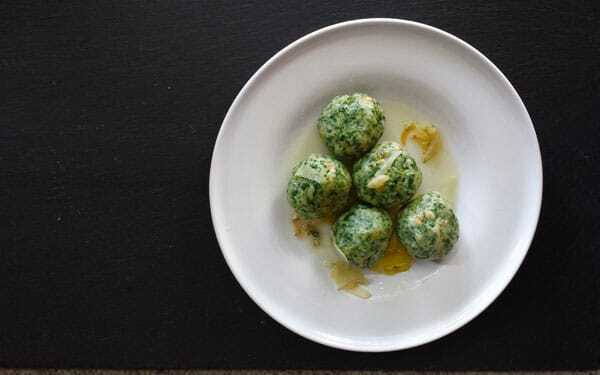 Called strangolapreti — priest stranglers — this recipe is from the far north of Italy, Alto Adige, near Switzerland and Austria, where the two cultures blur. How, exactly, they got their name is a mystery, but the most common tale is that a gluttonous priest imposed himself on a family, eating dumpling after dumpling after dumpling until, well, he choked and died. Most parts of Italy have something they call priest stranglers in their local dialect, and they’re all different shapes; apparently the tale of the gluttonous priest is universal; there is an excellent discussion of this in Oretta Zanini da Vita’s excellent book, the Encyclopedia of Pasta. 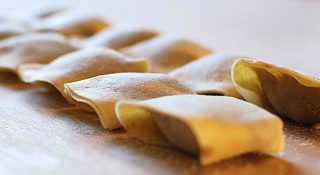 My actual recipe is an adaptation of one I found in another excellent book, written by Chef Jenn Louis of Portland, called Pasta by Hand: A Collection of Italy’s Regional Hand-Shaped Pasta. She uses spinach, but any leafy green that isn’t to tough will work. In cool weather, your options are many: Spinach, turnip or beet greens, arugula, dandelions, nettles, chard and mustard greens are just those that come to mind. 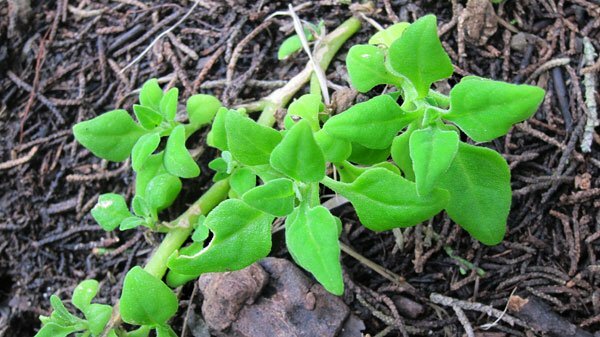 In hot weather, go for amaranth greens, lamb’s quarters, orache, any of the cool-weather greens that are still in good shape, or you can use what I do, New Zealand spinach. Whatever you use, these dumplings will impress. Cheap, filling, tasty. I like them served with the first garlic of the year and some good butter or duck fat… or, if you have it, chicken schmaltz. But play with it. Sauce this however you want, and if you like them, take the time to memorize the recipe — pretty much wherever you are, you will be able to find these ingredients, so it’s a great recipe to have in your back pocket when you’re in deer camp or on the road. Spinach is the default green for this recipe, but really any tender leafy green will work, from chard to all the wild greens, from dandelions to lamb's quarters to amaranth to New Zealand spinach. Arugula, turnip or mustard greens, beet greens are all other good choices. Serve these simply, either as a side dish to something meaty or some seafood, or by themselves as a vegetarian main course. I like a big white white here, like a Friuli from northern Italy, or a Riesling, Gruner Veltliner, or Pinot Grigio. Boil the greens in salty water until they're tender. This will range from a minute for delicate things like spinach or parsley, to maybe 4 minutes for New Zealand spinach or chard. Don't boil anything for more than about 7 minutes, or the greens will lose their pretty green color. Plunge the greens into a large bowl of ice water to shock them. Remove and squeeze the greens until they're just damp. Chop very fine and set into a bowl. Meanwhile, soak the bread cubes in the milk until they soften. When the bread is soft, mash it into a paste with your (very clean) hands so no large bits remain. Add this to the bowl with the greens. Add all the remaining dumpling ingredients except the flour. Add half of the flour now, and mix everything well. Try to form the mixture into balls about the size of a walnut. If they hold together well, you're good to go. If you are unsure, add the rest of the flour. Form the dough into balls, and roll each ball in a little flour. Drop the dumplings into the water you boiled the greens in and simmer them until they float, then about 1 minute more, about 5 or 6 minutes. Do this in two batches so you don't crowd the pot. Remove to a plate for the moment. To finish, heat the butter in a large sauté pan and cook the garlic slices gently until they just barely brown on the edges, about 1 minute. Add the dumplings and shake the pan to roll them around in the hot butter and garlic. When they're nicely coated, serve with a squeeze of lemon. You can find dozens and dozens of pasta and dumpling recipes on Hunter Angler Gardener Cook! I substituted ramp leaves for the greens. To. Die. For. Thanks for such wonderful recipes.